A searing piece of socially minded genre filmmaking, Black 47 is one of the most interesting revenge films of recent years. A real homegrown hit in Ireland, making the box office top 10 in its opening week despite only initially opening there, Black 47 comes with quite the reputation – for a low-budget film about the effects of the potato famine with two men from the other side of the world in the lead roles. Animal Kingdom’s James Frecheville is transformed as returning soldier Feeney, a man whose life is heavily beaten down in the first act, but doesn’t turn from meek to rage-filled; it feels as if its all behind his eyes from the start. While he first tries to deal with the encroaching English peacefully, it quickly becomes clear to all involved that blood will flow, but the way this happens is so matter-of-fact that it’s rather startling. Black 47 is not a film that asks you to enjoy the violence, that’s not its point, but it also doesn’t wallow in it. Director Lance Daly walks a smart tightrope throughout here and puts in an impressive shift; upsetting deaths are displayed on-screen with the dank, cold cinematography completely capturing a tone of hopelessness. That Frecheville gets surprisingly little to say is also not a problem. Feeney is a man of few words, but the film surprises in its focus on those trying to catch him. Hugo Weaving is rather captivating as Inspector Hannah, a man who has also had enough of those around him, but has come undone, thanks to the open brutality of his methods – as opposed to the more “respectable” evils doled out by Jim Broadbent’s effectively horrible Lord Kilmichael. He commands every scene he’s in from the off, but he never has any “big” moments; his character’s presence says as much as his words do. Terrific support is also given by Stephen Rea and Barry Keoghan, on various sides of the English/Irish divide, but particular credit should go to Freddie Fox, a man who juxtaposes his traditional good looks against pretty much everyone else on-screen – a soldier at the start of a career that could end like Hannah. If Kill Bill was a “roaring rampage of revenge” then Black ’47 would be a “quiet rage of retribution”, which, in these troubled times, will make some feel even more ashamed to be English. 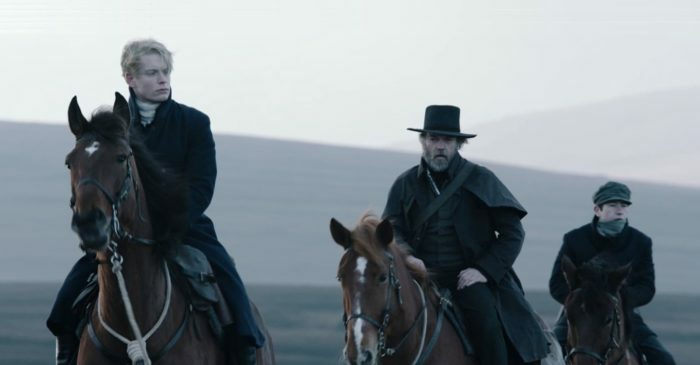 An oddly searing piece of socially minded genre filmmaking that never revels in its violence, Black 47 is one of the most interesting films in the revenge sub-genre in recent years. It’s not John Wick, but it’ll stay with you. Black 47 is available on Netflix UK, as part of £7.99 monthly subscription. Where can I watch Black 47 on pay-per-view VOD?